When it comes to watering your lawns and gardens, you have several options. 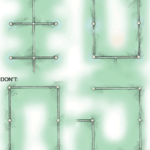 The simplest method is to hand-hold a hose with a spray nozzle or connect a hose to a lawn sprinkler that you move from spot to spot. But this can be a hassle because it requires your presence–if you don’t perform on schedule, your lawn and gardens turn brown. So much for going on vacation. A far more low-maintenance, dependable, less expensive, and hassle-free option is to use an automatic sprinkler irrigation system. 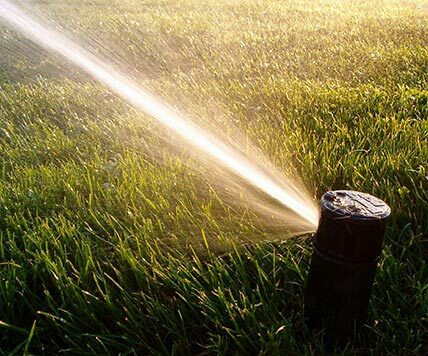 Installing lawn sprinklers is a surprisingly easy DIY project, is relatively affordable, and offers huge payoffs in convenience and your water bill. Drip irrigation reduces the amount of water needed to keep your garden alive. 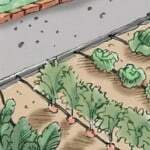 Where sprinklers would otherwise deliver water to the entire ground of a garden and sacrafice a good deal of it to evaporation, a drip system can target delivery of water directly to plants. It can continuously deliver drops of water to the root areas of plants, minimizing wasted water and encouraging healthy plant growth. Drip systems create healthier conditions for plants and without losing water to evaporation the way conventional sprinkler systems do. Using a small amount of water over a long irrigation cycle keeps the ground at the base of a plant consistently damp, promoting growth even in dry climates. Additionally, watering only the area around the roots prevents weeds from flourishing. Drip systems come in two varieties—the well-known system that uses flexible tubing and emitters to drip water onto the base of plants, and the newer “micro-irrigation” systems that use smaller versions of sprinkler components to efficiently water small areas. Both systems use the same main components for the water source, distribution, and emission. The major difference is in the types of heads the micro-irrigation systems use. Water source components connect the drip system to an outdoor faucet or irrigation riser; they include a filter to keep the emitters from getting clogged and a pressure regulator to keep the system at the correct water pressure (usually between 25 and 35 pounds per square inch). Distribution components include the pipes, fittings, and stakes that deliver the water to emission points. 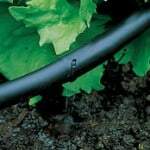 Polyethylene (PE) tubing is used commonly in drip systems—the newest types are flexible, long lasting, and safe for use with plants. Some tubing is made with recycled PE and will eventually break down. Vinyl tubing is very flexible but may transfer chlorine to your water, which in turn will harm your plants. In this section of HomeTips, you will find information about selecting sprinklers and drip system equipment, installing these watering systems, and general irrigation maintenance.